My laundry needs something! I love the size and space I have in there, but I think it needs a big shelf. When I built the house I had intended to put overhead cupboards in, but I ditched it last minute (money!). Since then I’ve happy been without anything overhead and I have decided I don’t need the additional cupboards. 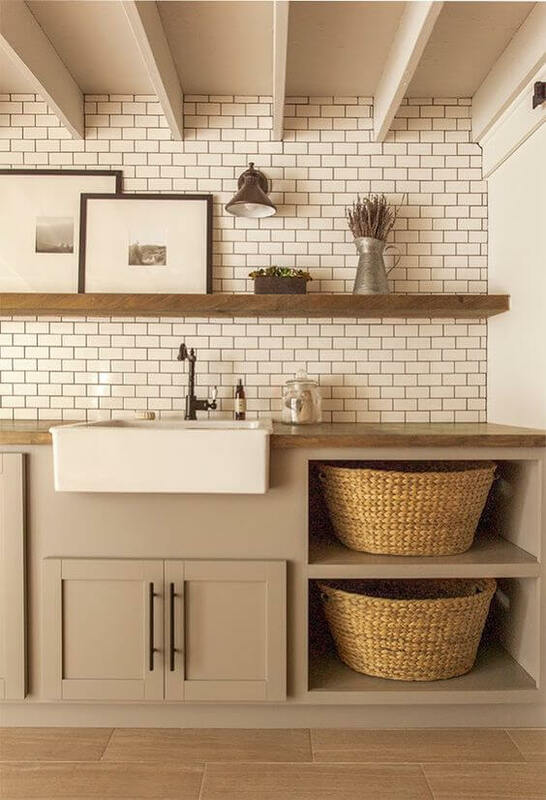 It would be too overwhelming and cumbersome (well maybe they would be ok, but $1,800-$2,000 for cupboards I won’t use is a little out of my range). There is enough storage in there already (I have a walk-in storage room off to the left). BUT, the wall above the bench is large and very boring. So I was thinking of putting up a simple white shelf. I could display a pretty print, a couple of jars and some towels. It’s long though – over 3m in bench. Here is what it looks like now. So off to the left of the external door I have that walk-in storage room. The solid door in the front on the right goes to the garage. Where I am standing is in to the kitchen area and on the right is a chalkboard wall. This room gets a lot of traffic through it! I am not in to hanging stuff, so bags/hats etc all get stored in the storage room. I like to keep my laundry free of clutter (except for the usual pile of folded washing I have on this bench!). Then I thought maybe a lovely shelf with leather straps could work? This way, if I do decide the shelf isn’t working (and want overheard cupboards down the track), I can easily remove it. Then I need to decide would I put the shelf all the way to the ends – or just float it in the middle? Or even have 2 shelves? We could re-tile that area too if needed. Decisions! Anyway, food for thought! Which option do you think I should go with? ♥ KC. 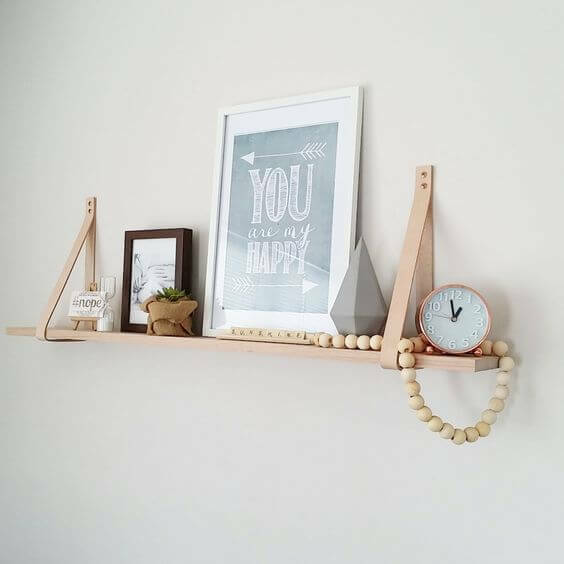 I think a timber feature shelf the whole way along would look great. 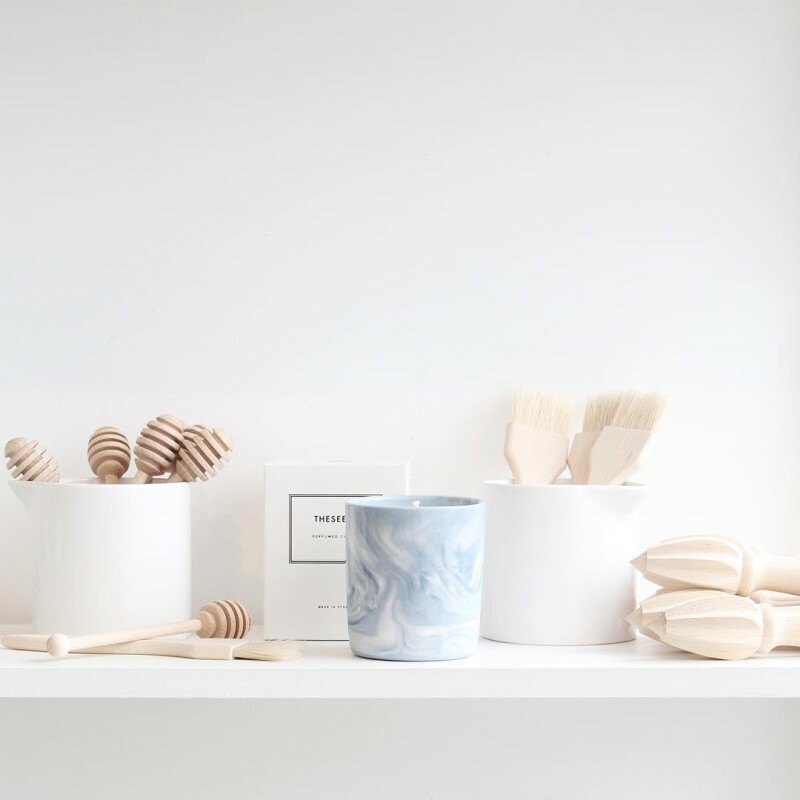 I like the long floating shelves in a natural wood or white, and you could do a colourful backsplash in like a sea green/blue to being in some colours…or any colour really and use that colour as the base for your little pieces on the shelves. Also how do you NOT have a dryer with all the laundry you must be doing for all your boys!!!? 2x Shelves across full wall! Love your straps idea too ???? I think the shelf idea is fab! 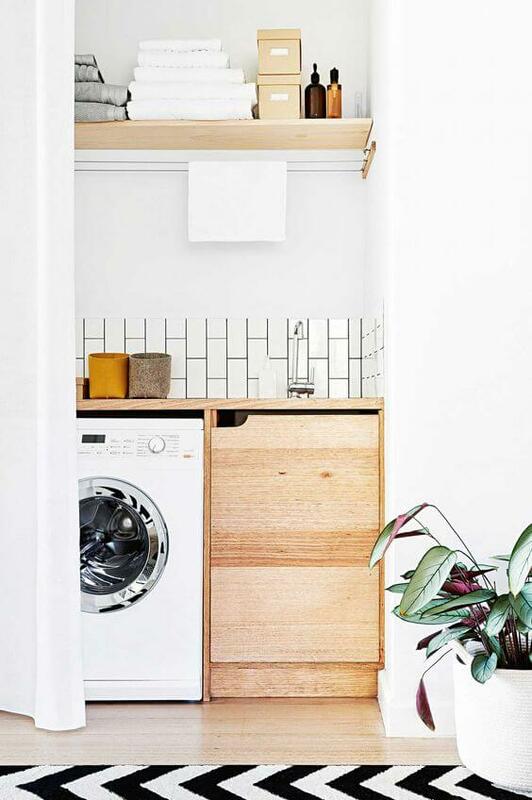 I love the Pinterest inspo’ with the tiles to the ceiling- looks great but, money?! We’re about to redo ours and I need help too! Agree, timber shelf/shelves. Maybe 2 half the length. That would allow for a beautiful print. I’d put a variety of white pots with greenery on the shelves ???? Perhaps clad the wall with timber / timber look low profile floor planks, then add a long shelf or two and stain with black japan. That would certainly make any greenery, copper, glass or jute products POP! Industrial chic ???? I could send you my laundry pic, I have lovely overheads, nice feature. Want to see? I installed the algot system from IKEA in our current laundry, overhead drying racks and a hanging rail is so useful for drying work and school uniforms. We’re building a new home with very similar space and colours to your home, the Algot won’t suit our space but I’m arranging with our cabinet maker to have the same functionality created, with icy cold winters and scorching hot summers it’s been a god send. I’m looking forward to seeing what you decide before I finalise my plans ???? love it! keep us posted on what you end up doing. Love Peta’s tip too about the drying racks. We too have freezing winters and boiling summers and getting clothes dry in the winter is a nightmare. I am in the process of designing a house to build and I have placed the laundry on the northern side of the house to get the winter sun so we can hang clothes in there to dry. I will also install a fan for some air movement to help as well. I will check out the ikea system you mentioned too Peta. Thanks! Following – I am the exact same issue! I have a blank wall on one side of my laundry and because I’ve never quite figured out what I want there, it’s become the de facto home for piles of “stuff”. It’s been seven years; time to get it sorted! I think an oversized print would look great – loving this one at Kmart! 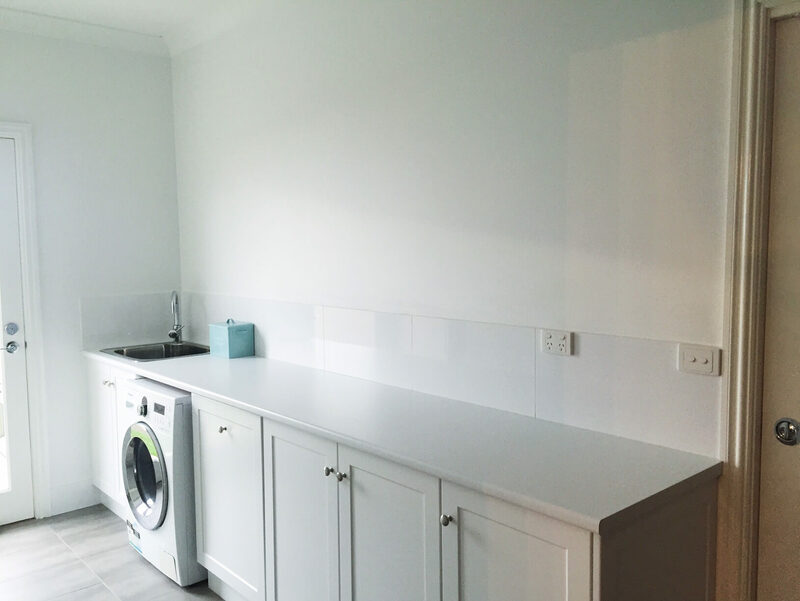 Overhead cupboards and a small rail above the sink. 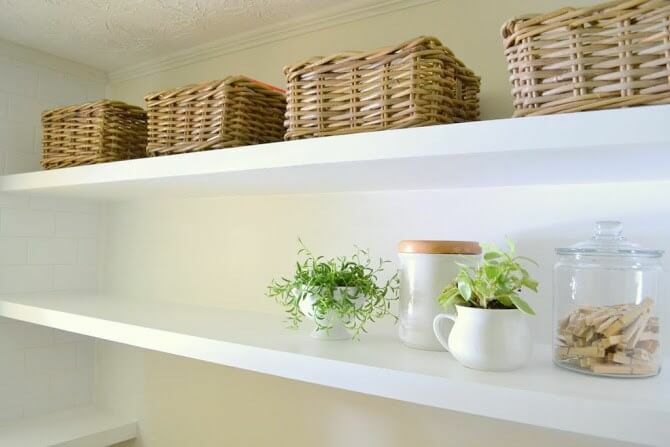 Open shelves look beautiful but waste valuable storage space. 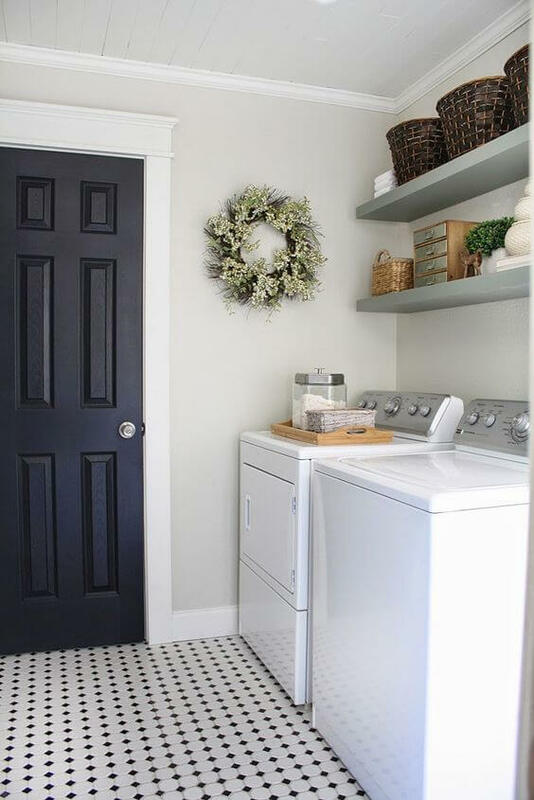 I’ve always viewed a laundry as a working room so I’ve never been to fussed about styling it.